This is wrapped set of two embroidered terry towels made by Bubu Craft. They look like one of most pretty gifts you have ever seen. It consists of nice soft towels packed in transparent tape with atlas bow. They are decorated by Mega Rose embroidery design. Furthermore each of them is added by name of its future owner. It seems that everybody would like to get such gift. There are three pretty little gift bags executed in traditional Christmas color scheme. They have identical sizes and proportion but different embroidery samples on front side. They are Christmas deer cross stitch free embroidery design, Deer cross stitch free embroidery design and Christmas Snowflake cross stitch free embroidery design. You may choose one of them or all to decorate your holiday souvenirs. There is cute textile bag which is best pack for Christmas gift you can ever imagine. It gives much more charm for every little gift you prepared for your friend or relative. It is because of Penguin's Christmas time embroidery design 4 used for its decoration. It is quite easy sample made by just one color of thread which is available even for beginners in embroidery. This is cool pack for Christmas gift decorated with Gnomes celebrate Valentine's Day too embroidery design. Originally which pretty sample was created for holiday of lovers. But author changed its color scheme and now it looks definitely like Christmas decoration. This pack made from rough natural fabric is good for some long objects such as bottle of wine or package of coffee. This is nice textile bah made from rough natural fabric. 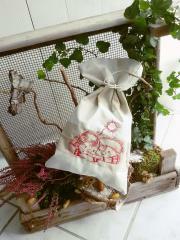 Due to its special form it can be used as pack for original gifts – such as bottle of wine or coffee package. Bag decorated with Gnomes celebrate Valentine's Day too embroidery design can be used both for Christmas and New Year gifts and also for Valentine’s day gifts. So you can make this work piece not being afraid that it will be unclaimed. 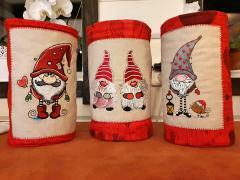 There is pretty set of three festival textile tubes prepared as original pack for Christmas gifts. Each of them has its own unique design in Christmas style. Left one is decorated by Cute gnome embroidery design. 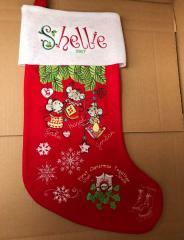 For one in middle author used Dwarf embroidery design 3. Finally left tube is embellished with Gnome in phrygian cap with hearts holding lantern embroidery design. This is original bright tube made from dense textile. Due to its convenient form it can be used for many purposes. 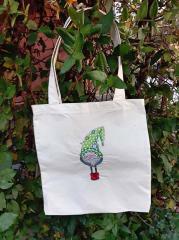 You can put pencils or markers inside it or take it as unusual pack for you Christmas gift. 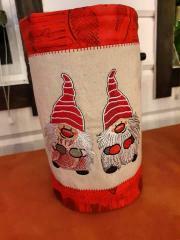 It is especially good idea due to Cute gnome embroidery design. This funny serious dwarf in traditional costume reminds Santa Claus. 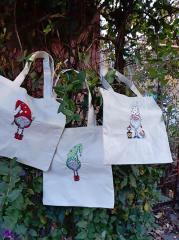 There are three nice embroidered textile bags executed in Christmas style. All of them are decorated with figures of funny dwarves in big caps. They are Gnome in red phrygian cap and boots embroidery design on left one, Gnome in polka dot phrygian cap and boots embroidery design on bag in middle and Gnome in phrygian cap with hearts holding lantern embroidery design on right bag. This is nice embroidered box in traditional bright color scheme. It is prepared to be original and cool pack for Christmas and New year holiday. They are embellished by two different figures of Christmas gnomes. 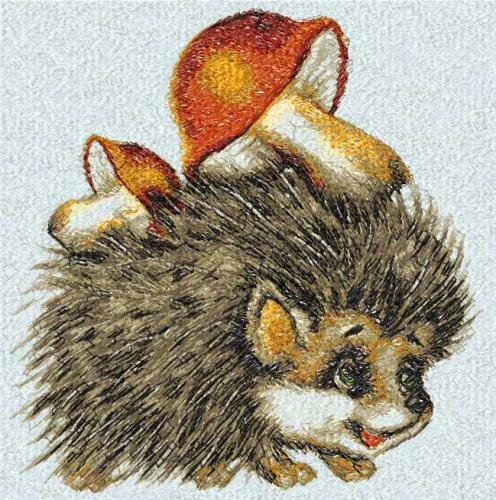 But look: both of them are made on base of Dwarf embroidery design 3. Secret is simple: just use some different details and make two dwarves instead of one! There are two embroidered textile boxes prepared for packing of Christmas and New Year gifts. They have bright color in traditional shades. 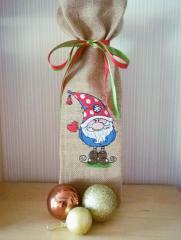 Each of them is decorated with original sample with funny dwarf. Author if these work pieces, Ann-kristin Kristoffersen chose following pictures for them. 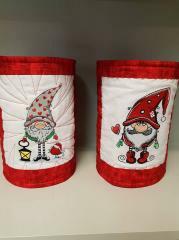 Left one is embellished by Gnome in phrygian cap with hearts holding lantern embroidery design, right one – by Cute gnome embroidery design. 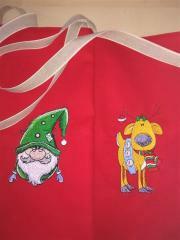 There are two embroidered bags ready for packing Christmas gifts. Both of them are decorated with figures of funny gnomes but they are different. 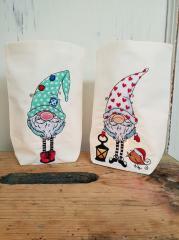 Left one is embellished with Gnome in polka dot phrygian cap and boots embroidery design. 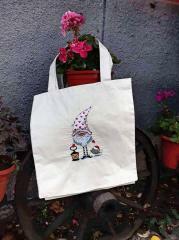 For right one author chose Gnome in phrygian cap with hearts holding lantern embroidery design. This gift bag will create merry holiday mood for addressee. This is pretty set of three textile bags. They are prepared for packing gifts for Christmas and New Year. But they also can be used as nice souvenirs for home interior which are able to create merry festival mood. This is because of Christmas gnomes embroidery design. Please note how creatively author used this sample. Only one picture became base for three work piece. 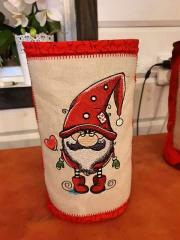 This is nice embroidered gift bag which is executed in form of traditional Christmas sock. Certainly this work piece should be decorated with thematic picture. Author chose Dwarf embroidery design for it. This sample is interesting and unusual image on Christmas theme which creates merry and holiday mood for everybody. This gift pack is definitely important part of coming festival. This is pretty textile bag which can be used for packing good surprise prepared as gift for Christmas or New Year. It is executed in simple but very impressive color scheme based in contrast. Image used for its decoration is Red Christmas dwarf free embroidery design. It is picture of funny dwarf with fluffy beard who wears big cap with cute little hearts on it. It is nice textile bag for gift packaging which has stylish and well elaborated design. It is made of dense fabric reminds sackcloth. Band at it top part and embroidery sample used for embellishment are executed in same color scheme. This sample is Snow Maiden free embroidery design. This embroidery design is very good for decoration of gift bag for New Year. This is very original gift pack which is the embodiment of design idea. It includes few elements at the same time: they are natural materials, hand work, lightness of the lace and certainly the spirit of love creates by the most romantic city at the world. Paris Eiffel tower free embroidery design is not just the name of the capital of France but also the silhouette of its most famous symbol. This is the front view of hand made gift wrap decorated in romantic style. The idea if this pack is based in the contrast between rough mat with fringe sticking out in all directions and lightness of lace used for the border at the bottom and bow at the top. The main detail of this pack is Paris Eiffel tower free embroidery design: the name of the famous city added by its well-known symbol.